This was, without a doubt, the most difficult journey I have ever made. I have travelled to Everest Base camp, have travelled squeezed into the boot of a car on an overnight journey with two toddlers sleeping in my lap, and I have travelled daily hanging out from the doors of Bombay local trains. 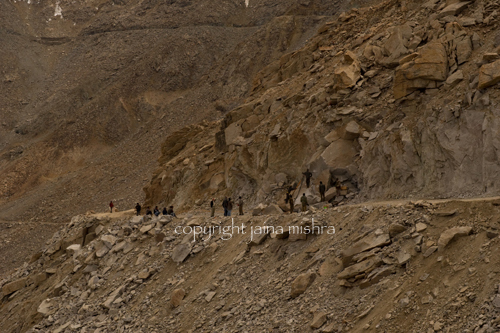 But nothing has been quite as difficult as this journey through Khardungla pass. 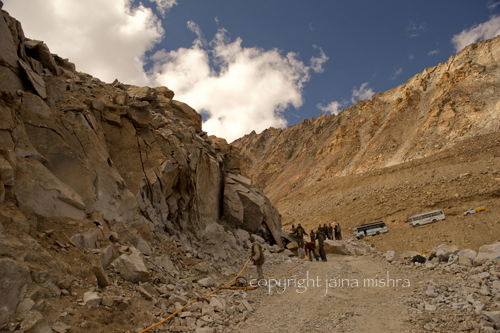 The pass connects leh valley to Nubra valley and is the only way to reach Nubra. 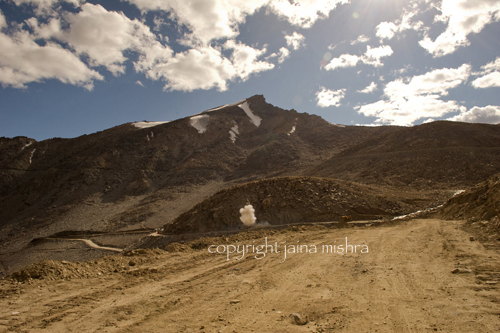 The incessantly winding roads posed a problem but it was trivial compared to the problem posed by the high-altitude of the pass.The subtleity with which the discomfort crept up into the body made it almost unnoticeable. But at the apex of the journey, at the pass itself, when the driver stopped the car for a tea break and I stepped out of the car, is when I first realised how badly I was hit. I couldn’t walk straight without conscious effort. And I couldn’t walk at my normal pace …. Rest and tea did nothing. The odd thing was there was nothing that I could really complain about. No nausea. No dizziness. Just a feeling that I was not in total control of my limbs or my senses. 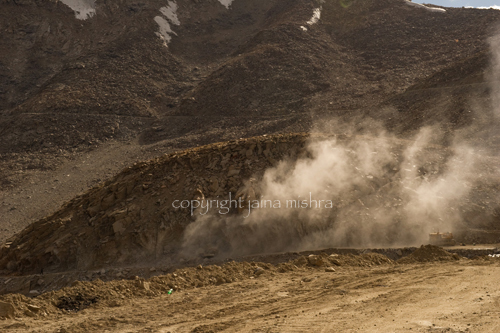 Fortunately, I had a car and no one – not even me – needed to rely on my compromised skills of navigating my body – and so we were on our way again to Nubra valley. 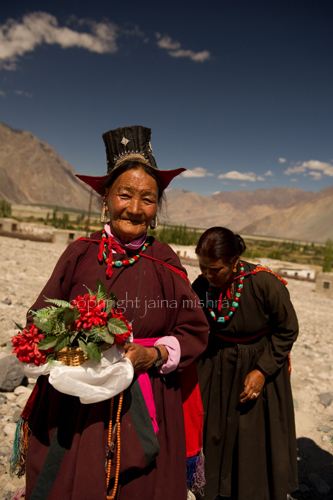 Made friends with some lovely local matrons who had walked to the highway just to greet and wave to a Lama visiting this valley. 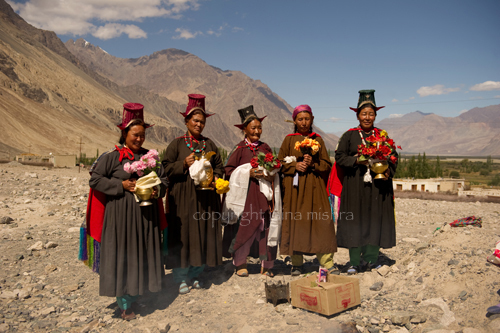 Sat on the roadside with them, chatted and waited for the Lama-ji along with them. 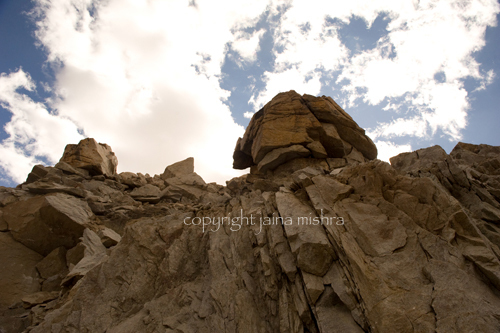 After about an hour had passed – just sitting on the rocks lining the highway and talking about life, my driver thought it was time to leave as we had a long way to go. I begged for a little more time, unwilling to let go of the moment. And so we just sat there. doing nothing. Just expeirencing each other’s presence. We had already finished ‘saying’ all the things that we could have to each other. So we just sat. Comfortable. Not restless. Just watching the empty landscape and the empty highway. Until 5 minutes later I realised that I could not stay here forever. And so I left my new friends. With a smile in my heart. These unexpected encounters are among the most cherished ones in my treasure chest of memories. Because there’s no way to engineer these moments – I see them as gifts of circumstance – gifts that I have seized and lapped up greedily. I have come to terms with the fact that those moments together are all that was destined and so as I wave good bye to these warm hearted contented souls, I tried not to be sad. A new word is needed to describe these deep but momentary and transient chance bonds that serendipity gifts to me. Stranger-friends maybe? 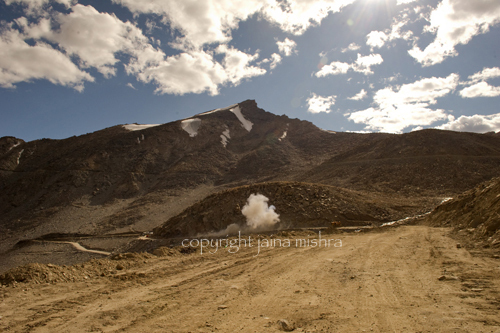 And now as we inch our way back up the slopes again to Khardungla pass before we reach Leh, I sleep in the car. With not even the slightest clue of the adventure thats waiting to happen. In my sleep I sense that we have stopped but I continue to sleep. Until the commotion outside seems too important to ignore. My driver who is standing outside the car gives me a news update. A landslide. Just 4 cars before mine! Large rocks blocking the road. No injuries. No cars under the rocks. Just a major roadblock that we cannot circumvent. 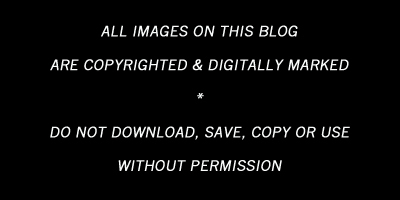 We must wait. Even if it takes 24 hours, we have no choice. The line up of cars increases with a new car joining the traffic jam every 10-15 minutes. On the opposite side an army convoy with trucks filled with men lines up. People from all over the world – curious tourists spill out of the cars to watch the landslide and share their individual confusions about the next step. Men in recovery trucks arrive with equipment. Almost immediately. 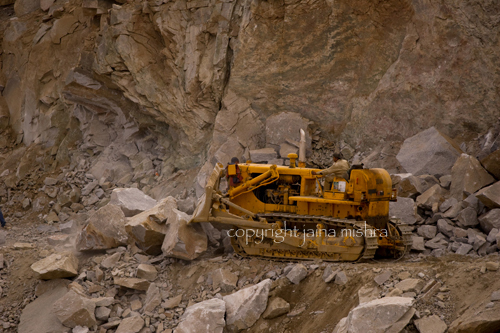 A full scale recovery operation follows. 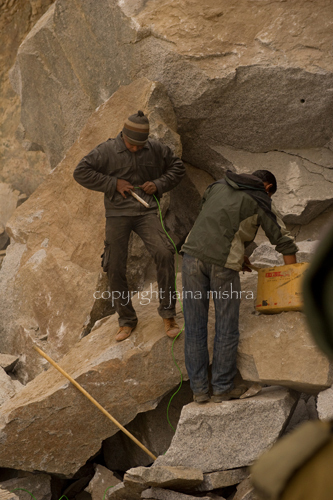 Drilling of holes into the fallen rocks. 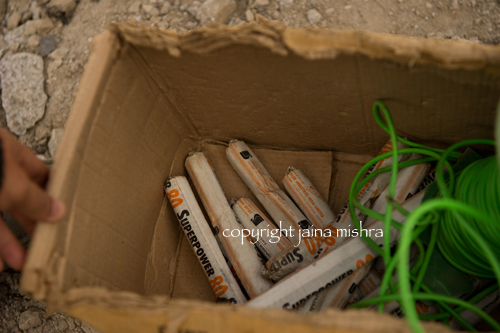 Dynamite placed strategically inside the rocks. Shooing away of all bystanders (like myself). Just above the drilling hero! 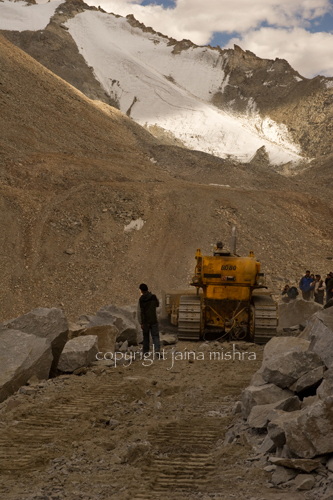 And then the bulldozers pushed the smaller pieces into the valley clearing the traffic jam consisting of tourist taxis and a whole big army convoy. 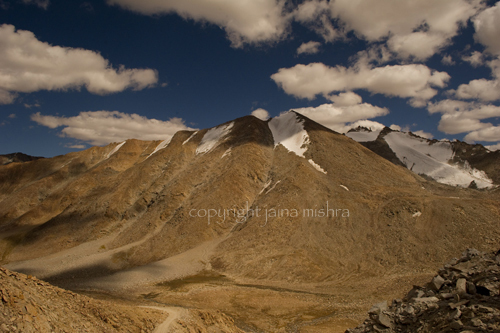 250 m from Khardungla Pass. The entire operation took about 2.5 hours. The immediacy of the recovery operation was impressive. This was India – an India that everyone loves to hate and speak badly of. 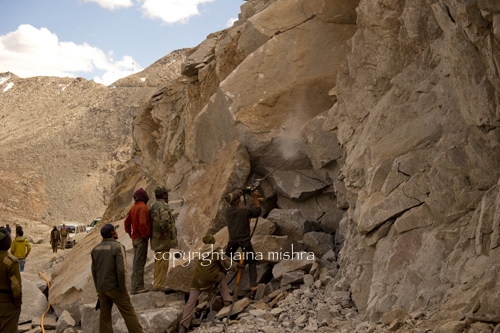 But at the ground level, in the remote areas – an Nubra is as remote as it can get – everything works. Very very well. And so with a swollen sense of pride and joy I left, completely rejuvenated. 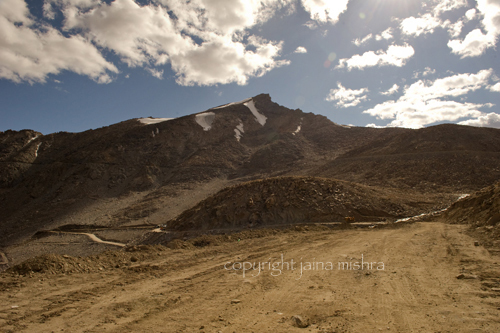 Now I could take on Khardungla Pass and more! 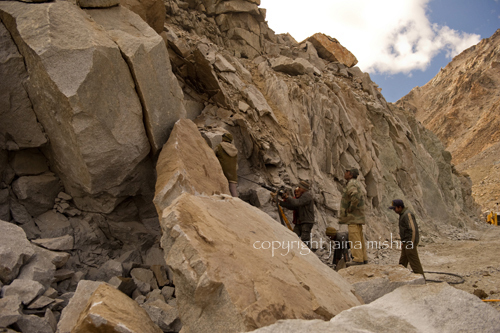 I was told yesterday by an expert that the Himalayas are very ‘young’ mountains and this is commonplace.Nothing extraordinary! But for me it was a first. Did my car just escape because of my reluctance to leave those ladies? An adventure, a notional escape, and a chance encounter with stranger-friends. 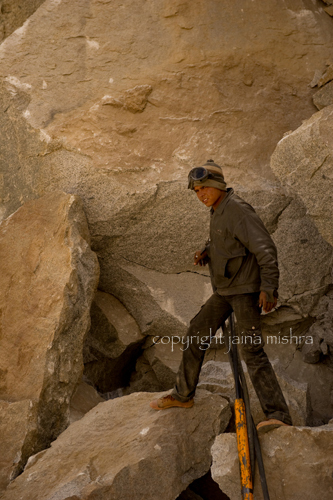 This entry was posted on October 24, 2011 by wovensouls in Culture Kaleidoscope and tagged altitude, art photography, Asia, blast, block, bulldozer, cultural, dynamite, ethnic, explosion, fall, high, himalaya, himalayas, india, journey, Khardung, Khardungla, la, ladakh, landslide, Leh, lifestyle, mountain, Nubra, Nubra Valley, Pass, photo essay, photographer, Photography, recovery, road, rock, tradition, travel, travelogue, wovensouls.